The New York Rangers have seen much improvement on the ice this season, except in the area of the power play as this unit continues to struggle. Coach David Quinn has seen a slight upgrade in production with the return of Mats Zuccarello and Pavel Buchnevich to the lineup, but getting back the quarterback of the unit, Kevin Shattenkirk, will be a welcome addition. Quinn is quite confident Shattenkirk’s return will re-ignite his struggling power play. The top unit rebounded nicely by scoring six power-play goals in their last 21 man-advantage opportunities, which puts them slightly above their season scoring average (20.4 percent) as the power play is currently ranked 18th in the NHL. 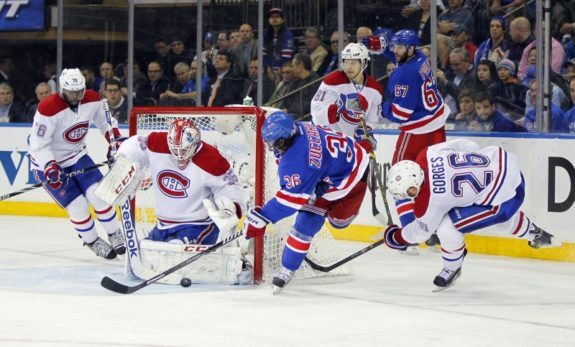 This sudden increase was a welcome relief as the Rangers went 1-for-15 on the power play in their prior eight games. Still, the Rangers have struggled badly in a tough stretch of the schedule as they have gone 4-6-5 in their last 15 games. You get the feeling the coaching staff hopes the return of key veterans to the lineup will provide some stability and energy to a team struggling to find their identity. Rarely has the Rangers coach shown any public frustration over the lack of production from his power play. Quinn believes his special team’s units need to show more intensity and play at a faster pace when holding the man-advantage. The main problem for the power play has been entry into the offensive zone as there been too much individualism which eliminates any chance of good puck movement. For Quinn, the power play is all about making quick passes that gains better looks at the crease. He doesn’t want to see either of his top two power play units looking tentative when moving the puck as the goal is freeing a designated sniper to take an open shot on net. Too often, the Rangers have failed to capitalize on early man-advantage opportunities that could have gained momentum in games. When healthy, the Rangers first team (Mika Zibanejad, Kevin Hayes, Chris Kreider, Shattenkirk and Zuccarello) have rarely shown the consistency needed to be considered one of the NHL’s top power play units. Collectively, they’re not winning enough puck battles along the boards or making that extra pass that sets the other person up for an easy scoring chance near the goal. One of the toughest losses that hindered the Rangers power play was Buchnevich’s absence from the lineup with a broken hand as he was the staple of the team’s (teamed with Tony DeAngelo, Brett Howden, Filip Chytil and Jimmy Vesey) second unit. Quinn like this group because they’re active in the offensive zone as each player battles and competes to moving the puck towards the net. But, injuries have forced lineup changes that dissolved any semblance of chemistry on either power play unit. Quinn hopes the return of Shattenkirk to the power play will offer better execution and handling of the puck as he’s very capable of beginning a rush out of the defensive zone. Injuries are apart of the sport and every organization has that “next-man mentality” when replacing players in the lineup. Shattenkirk’s replacement, Neal Pionk, has done a nice job of distributing the puck from the blue line, but Quinn is happy to see his top special team’s playmaker back in the lineup. Shattenkirk can reignite the power play by quickly setting up shop in the offensive zone and begin peppering the goalie with shots from the point. Hopefully, this type of pressure results in easy rebound goals by teammates in the slot area. The Rangers cannot fall into the trap of too much individual play when on the power play, and instead, do the little things that win puck battles in the offensive zone. The latter should offer more odd-man scoring chances near the crease. The return of Zuccarello and Buchnevich to the power play has added more than enough talent to change the Rangers fortunes around. Both players have shown the ability to assist with winning offensive zone face-offs that gains an advantage on their opponent. But, you recognized quickly that it will take more than scoring goals to build a consistent power play. Quinn has made slight adjustments to his power play alignment that better utilizes his player’s offensive skills, but the return of Shattenkirk might be the barometer needed to show things are finally coming together for the Rangers. The hope is for the team to have two cohesive power play units. We’ll learn quickly if Shattenkirk’s return to the lineup pays immediate dividends.